Freezing bananas for smoothies is nothing new. It’s something that many people already do on a regular basis and I’m sure my method isn’t especially innovative. It has definitely improved my smoothie routine, though, and wasn’t something that I actually thought to do until fairly recently, sometime within the last year. So I’m going to share it with you in case it hasn’t occurred to you yet either, or in case you just need a little inspiration to get your freeze on. I first started doing this in response to a minor mommy problem. Roman loves bananas and asks for them often. I never know, however, whether he’s going to eat a small chunk and be done with it, or if he’ll polish off three of them and ask for another. So there are times when I’m left with a partially eaten banana, and I’m not always up for finishing it myself. Instead of counting it as a loss and composting the remains, I began freezing them and tossing them into smoothies later. After seeing how awesome it was to have a stash of frozen bananas on hand, I decided it was something that I needed to have available at all times. And thus, the freezing of the bananas began. Frozen bananas blend up super thick and rich. Take the creaminess that bananas add to smoothies and multiply that by ten. They’re cold. I don’t personally care for warm smoothies, nor do I enjoy a smoothie with the sort of watered-down flavor/consistency that blended ice can produce. 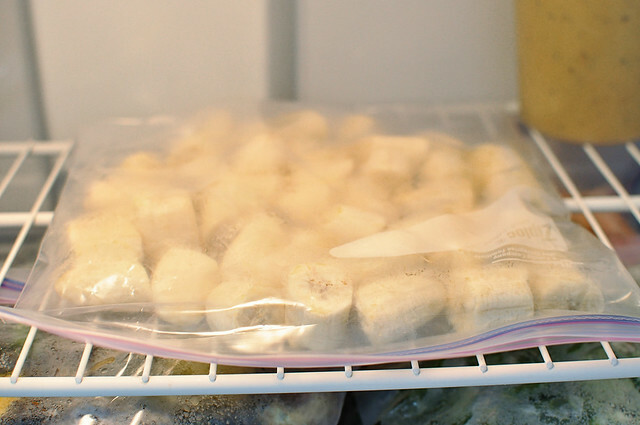 Frozen bananas make it cold and keep it flavorful. 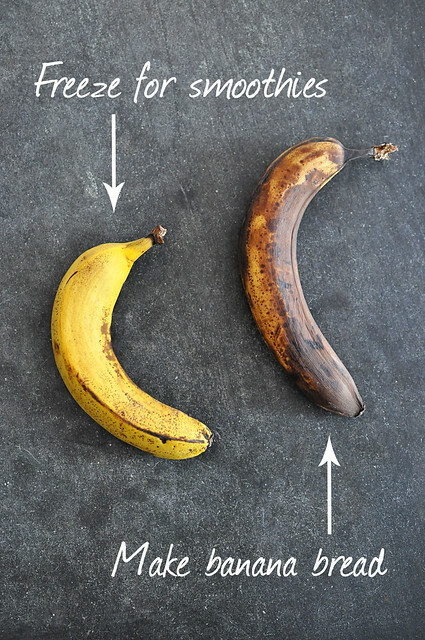 Maintaining a routine of freezing bananas has also been helpful for those times when we just don’t get through a bunch before they become too ripe to be palatable. When they reached that point, I used to let them go black and then bake with them. I still do that occasionally (there are muffins and cookies as evidence coming soon), but smoothies are generally a more healthful option. Speaking of ripeness, when freezing bananas for smoothies (or banana ice cream! ), you don’t want them to be too too ripe. They should either be perfectly ripe or a day or two beyond, right at that point where you could still eat them but they’re getting to be a bit too sweet. When making smoothies, that cloying, overripe taste doesn’t even out like it does when making banana bread. Alright, enough exposition. Let’s do this. It’s helpful to keep this in mind when you actually go to use them. Fill the bag about half to two-thirds full. 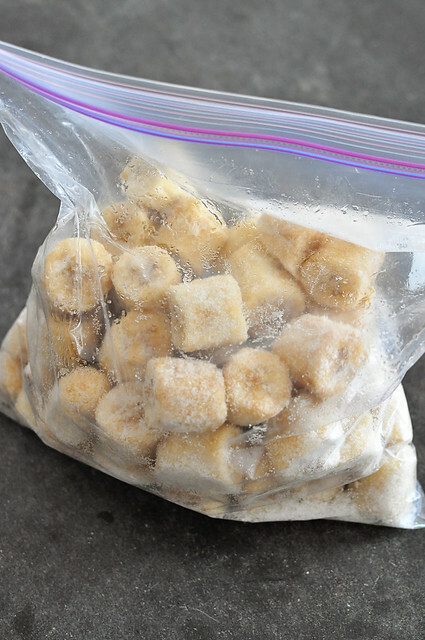 Press out some of the air, seal the bag, and lay it flat in your freezer, so that all the banana chunks are in a single layer. This way they won’t all freeze together in a giant clump, and if some do stick they’ll come apart easily. Allow the banana pieces to freeze completely, overnight is best to be certain. 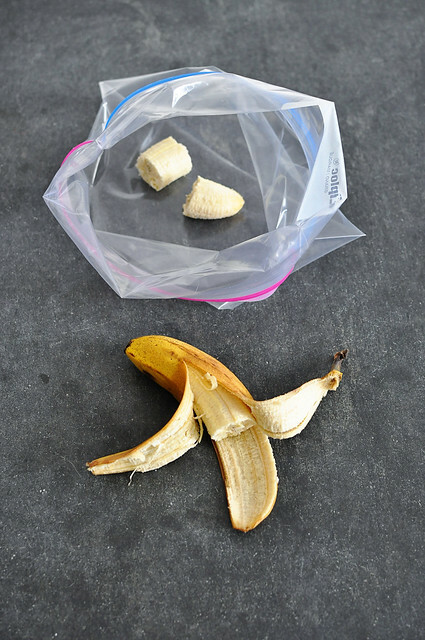 Once frozen, shake/break up the bananas into the bottom of the bag to store. 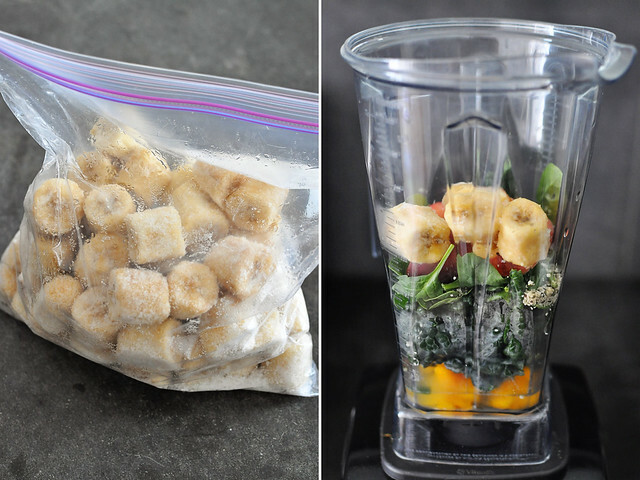 Grab chunks for smoothies as needed. And that’s all there is to it! Easy peasy and totally life-changing—if you’re really into smoothies, that is. You can also go ahead and drop in a few chunks here and there if, for instance, you have a single banana that goes past the point of eating, or if you happen to have a toddler who insisted he wanted a banana but decided he was done after only one measly bite. Oh goodness–tahini chocolate sounds amazing. I’ll definitely have to give that a try! I love freezing my bananas and putting them in my daily protein shake, so good!